I always look forward to accessorizing Summer outfits and styling the perfect statement necklace but on those dreadfully hot days when wearing jewelry is just short of total discomfort, there are other ways to add a little pizzazz to your outfit! Now I'm not talking flower crowns or headbands (although channeling your inner Lana is never a bad idea), I'm talking summer time sunnies! During the Summer time especially, sunglasses are a great way to express your style as there are endless shapes, colours and designs to choose from. Anyone who knows me knows that I'm a sunnies fanatic, continuously experimenting with different looks & forever searching for the perfect pair suitable for my face shape (or is that just something I tell myself to justify my growing collection? ;) ). 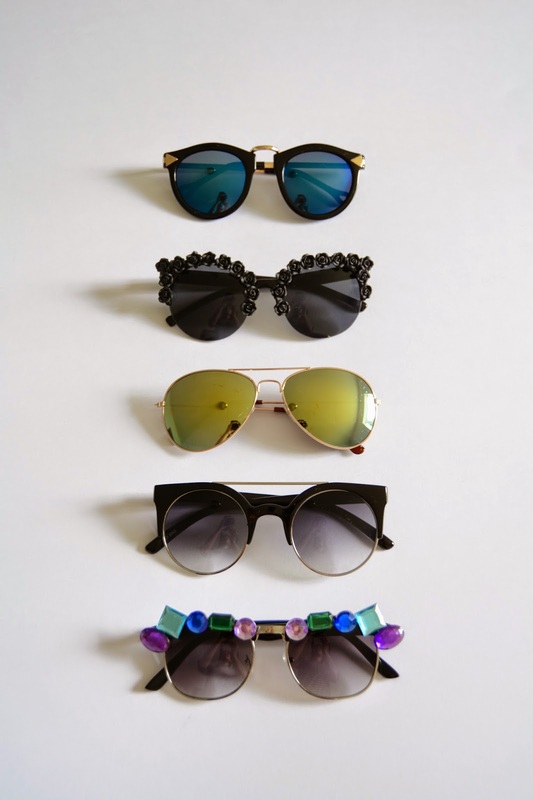 Here are some of my go-to sunglasses this summer! Which one's your favourite?